Alpaca, Get Yer Alpaca Here! Since I live out in the boonies, and countryside even boonier is close at hand, I have the opportunity to see plenty of critters that all you city folk don’t. For instance, I regularly see deer (aka, rodents with hoofs), red-tail hawk, the rare bald eagle, beaver, wild turkey, and peacocks. Okay, that last one is just a bizarre fluke since they don’t really belong in my boonies, they’ve just been brought in and set loose by someone. In addition to the wild critters, there are any number of domesticated and semi-domesticated animals close at hand. Horses and cattle and goats, of course, but also emus, a zebra, bison, and lovely little alpaca. Good friends of mine own a ranch called Bluestone Meadow up in an area of Northern California known as Apple Hill. They grow pumpkins in the fall and scrumptious, fragrant lavender year-round. They’re developing a Christmas tree farm. 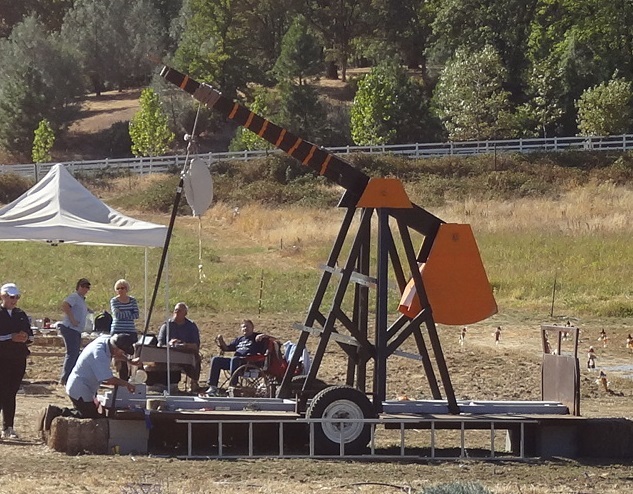 They have this amazing trebuchet they use to fling pumpkins with during pumpkin season. 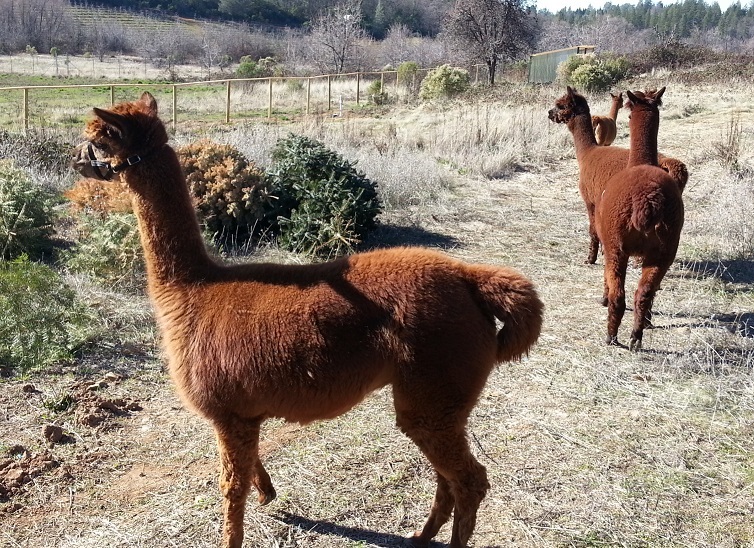 They’d been wanting to add alpaca to their farm, and found four females at a ranch where the breeder was selling out her stock. I was about to sell my horse trailer, but I took it on one last haul up to Grass Valley. It was very entertaining watching them wrangle the “girls” onboard. Alpaca don’t exactly lead as willingly as a horse (at least these didn’t–they were a bit rusty). 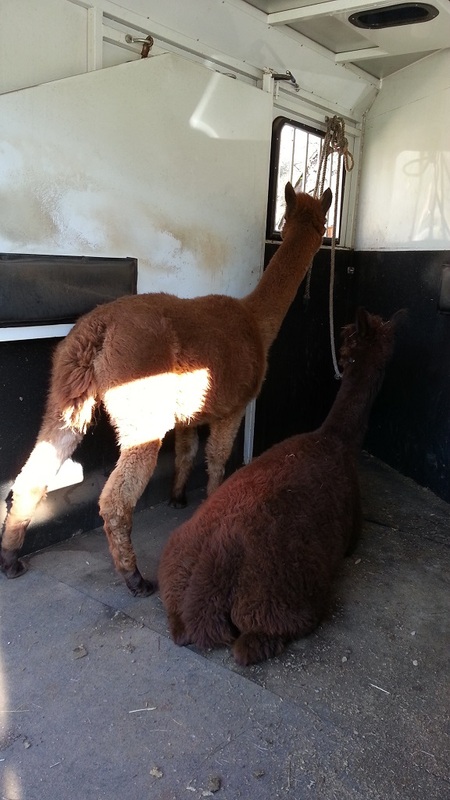 But what’s cool is that when alpaca ride in a trailer, they “cush” (if I’ve got the spelling right). They lie down, which makes them much easier to transport than horses. Once the first two were in, the second two should have been a piece of cake. But while the third alpaca hopped right in, the final one had to be persuaded. It took a little wrassling, lifting her front feet onto the trailer bed to persuade her back feet to follow. But then even she was inside, and we were ready to head out. They traveled pretty well (although a few times, I wondered if one or more of them had un-cushed because the trailer was rocking) and after backing the trailer into the pasture gate, they all exited and explored their new digs. I took a couple of videos, one of them wandering about, and one of the smallest girl, Foxy, meeting Jake, one of their the Bluestone Meadow dogs. A footnote about Jake. He was obsessed with these new giant creatures and managed to make his way into the pasture while my friends were away. When my friends found him and got him out again, he was covered with stinky alpaca spit. I hope he learned his lesson. 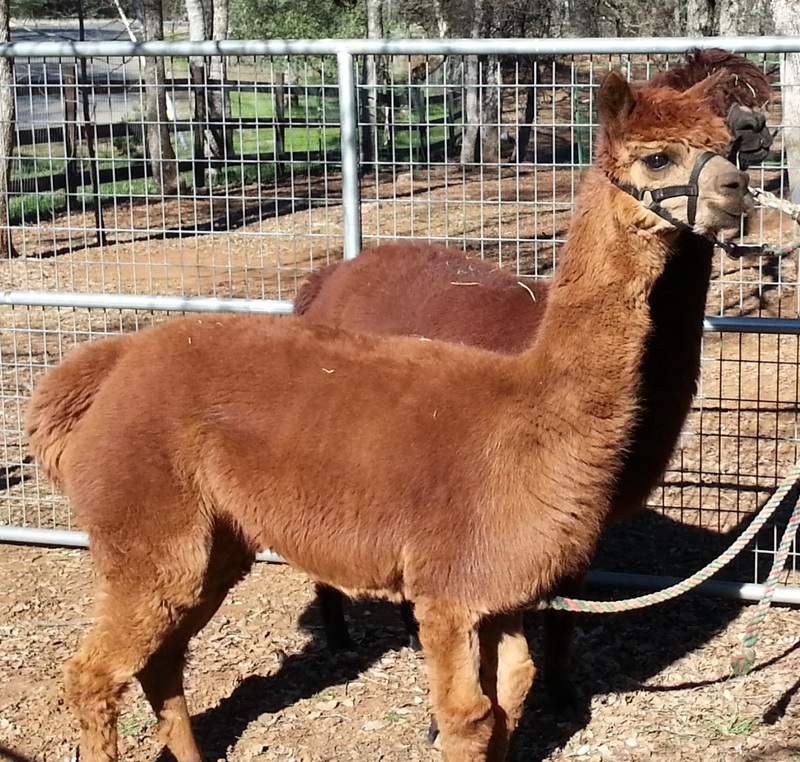 This entry was posted in Cats Horses and Other Pets, Family, Unusual Hobbies and tagged alpaca, bluestone meadow, country, rural living, tankborn trilogy. Bookmark the permalink.